From Rockville go north on B Highway 1 mile, B becomes P Highway, continue north for 2 miles and turn left (west) on the gravel road. Go ½ mile and the cemetery is on the south side of the road. 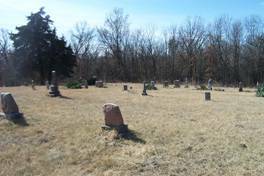 “No one seems to know the date of the first burial in the Pleasant Grove Cemetery. For a while it was called the “Meier burying ground.” On March 28, 1874, John Henry Meyer and his wife Mary gave an acre of ground for the cemetery. Twenty-three years later, on August 23, 1897, seeing the need for a larger cemetery, the trustees of the Pleasant Grove Christian Church bought the acre of land to the east of the one donated. The trustees were J. S. Horner, T. F. Horner, Preston Judy and Isaac Pryor. The church paid 25 dollars for the acre. 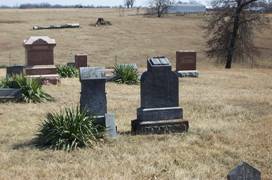 A cemetery plot sold for $0.50. The Pleasant Grove Church was organized May 25, 1879 with 29 members. The meetings were held at school houses: Pleasant View (thought to be Brush College), Haynes and Prairie Hill. In the summer, services were often held in the cemetery grove. Basket dinners were a part of some of the summer gatherings. The first name on the original list is Henry R. Price. His wife, Lucinda E. Price, follows. Then Robert Lynn, Alice S. Lynn, Elijah Barnes, Isabella Barnes --- W. F. McCoy, Phoebe Piepmeier and others. At the November 1883 meeting “before services, the church proceeded to elect Elders; Brother B.R. McCormack, Brother W.S. Johnson and Brother R. Lynn.” Deacons also were elected: Brother A.E. Corbin, Brother J.H. Horner and Brother L.L. Stotts.” The clerk elected was G.L. Edgerton. Two elders elected later were Asea Landon and Elijah Barnes. The Pleasant Grove Christian Church building was erected in 1884 on an acre of ground donated by the Preston family. It is across the road from the cemetery. It is said that Henry Meyer donated the hardwood for the frame. Most of the labor was donated. It is thought that G.L. Edgerton was a carpenter by trade. Meetings were held on the “Third Lord’s day” of each month. Records show that in May 1884 the congregation “met the third Lord’s day in April at the new church house. Services by Brother Hude at eleven and also four in the evening.” This seems to be the first record of using the new church building. The membership in 1889 was 80 members. It included Nettie Brown, Lizzie Peeler, Phoebe Piepmeier, Anna (Hook) Ooley, Lillie Griggs, Eli Griggs and wife Mary. Many different pastors served the church, likely receiving the Sunday’s collection as their pay. In later years, Rev. Henry Price served this church for many years and was hired by the year. It is said that he lived in Schell City and drove to his appointments with horse and buggy. Services were held in the morning and afternoon. Later the afternoon meeting was moved to “early lighting time.” Still later, services were held Saturday night, Sunday morning and Sunday night. These notes are taken from the earlier of two old record books of the Pleasant Grove Christian Church. These books were looked after by Oma May (Ammons) Attebery for many years and upon moving from the community a few years ago, she turned them over to the Secretary of the Pleasant Grove Cemetery Association, Mrs. Ethel Willems, Appleton City, Mo. Other dates came from the office of Recorder of Deeds of Bates County, Mo. With the coming of cars and many country people finding employment in cities, the rural population declined and so did rural churches. Sunday School was held at Pleasant Grove church for many years after “preaching” stopped. Mrs. Caryle Douglas’ funeral, in March 1942, was one of the last services held in this church, with Rev. H.E. Carpenter as minister. For many years Lester Meyer and Adolph Durst looked after the cemetery. Later, Leonard Welch gave generously of time and money to keep the cemetery. All are now deceased. Erma (Price) Walker’s funeral was held here in 1949.